For many who live in Southern California — Los Angeles in particular — the desert is one of the quickest and easiest go-to escapes. Whether it's a remote getaway in Joshua Tree or a luxe staycation in Palm Springs, the area offers such a remarkable change of pace in terms of atmosphere and landscape that even a quick weekend away can totally reset you. And in addition to the close proximity, what makes the desert such an accessible, road-trip-worthy destination is the variety of stops along the way: from a hidden gem spot where you can grab a killer vegan chili dog to an insider-favorite shop for finding psychedelic vintage dresses and more. Read on to see some stops that ought to be on your list next time you're traveling through. Mid-century modern Airbnb's in Palm Springs are nice and all, but for a little change of scenery, try booking a room at this cult-favorite hotel. In addition to the brightly colored "adobe bungalows" — which boast adorable names like Dandelion and Cinchweed — with private patios, this spot offers a saltwater pool, continental breakfast, communal yoga sessions, and a restaurant that utilizes herbs and produce from a garden on the sprawling property. Besides all that, it's shockingly affordable. www.29palmsinn.com, 73950 Inn Ave, Twentynine Palms, CA 92277. We can't think of a better way to describe this middle-of-the-desert bookshop than the way it refers to itself: an "oasis for book lovers." If you're in search of a particular read, you might not have such luck but what you can expect to find here are pre-loved treasures you never even knew you needed. What's a trip to the desert without a quintessential sound bath? This spherical structure in Landers (about 20 miles north of Joshua Tree) has a pretty wacky history as a meeting place for UFO enthusiasts, but is best-known now as a spot for some seriously memorable mediation amid the soothing hum of quartz crystal bowls. Renowned artist Noah Purifoy lived and worked in Joshua Tree, and his public outdoor museum was a project in the making for the 15 years that preceded his death in 2004. The property features over 100 of his works, including several large-scale found object sculptures. Getting the opportunity to view these pieces in this context is a totally memorable desert experience. Whether it's for a steak dinner or a show by the likes of Timber Timbre, Neko Case, or Rufus Wainwright (among other notable performers), a stop at this watering hole in Pioneer Town is a must for those in search of a little desert entertainment. Heads up: you're bound to run into a fellow Angeleno or two here. 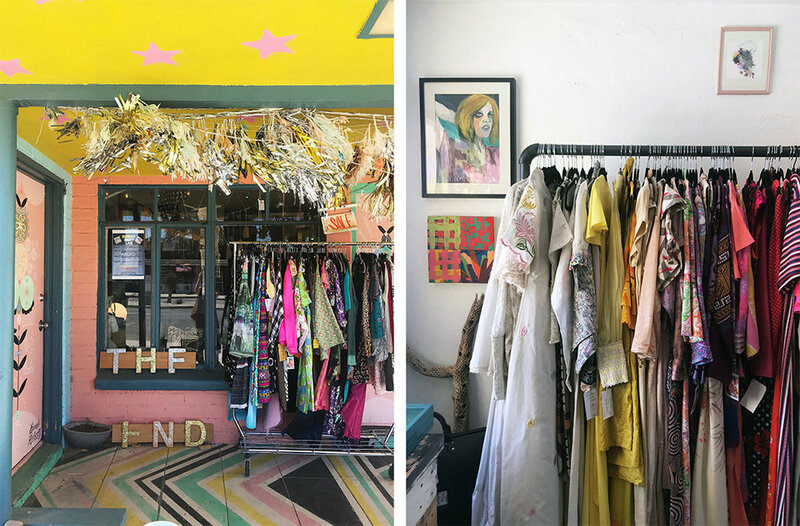 Echo Park vets from around the early aughts probably remember Kime Buzzelli for her stylish, slightly psychedelic paintings and her artsy shop, Show Pony, but now the artist and costume designer owns the desert's coolest place to shop curated vintage. At the Yucca Valley boutique you can pick up a 1960s era polyester maxi, a pair of Miu Miu platforms, or any number of other gems from both the distant and not-so-distant past, plus art, apothecary items, and pieces by contemporary independent designers. Step into an Instagram-worthy explosion of desert-friendly flora at this botanical garden in Palm Springs. Plant enthusiasts will love being fully submerged in cacti and other succulents beyond their wildest dreams. Most Southern Californians already have a short list of go-to eateries during any jaunt through Palm Springs, but if this teeny little spot isn't on yours, you're missing some pretty stellar hot dogs. Yep, hot dogs. Sound basic? Give their vegan chili dog, Chicago-style sausage, or chicken and waffle (dog-style) a try and you might disagree. If pampering is on the agenda, there's no better place to rest and rejuvenate than this Desert Hot Springs oasis. If you're able to spend the evening in town, this spa and hotel offers super stylish but cozy rooms and suites, but if you're just there for the day, shell out the $125 for access to the healing hot mineral springs and communal movement classes. You can also add on separate treatments like a craniosacral massage, water therapy, or mud baths. You'll leave decidedly changed.